In response to the people who just don't get the whole "flip book" thing, but really, to thank all those people who do "get it", and like my Dragonfly Flipz movies, I've posted a small Game Flipz Demo for download on my website. 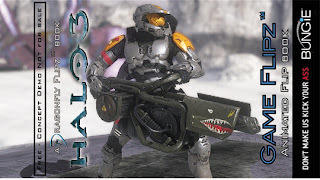 Just click on the Halo 3 Game Flipz Book with the Flamethrower cover. 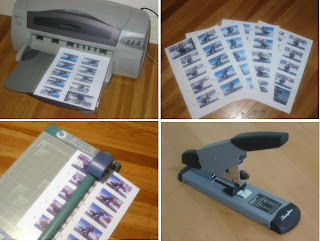 Then, download the .pdf file, print it out, cut the pages out, assemble in order, staple and flip. There you have it , your first Dragonfly Game Flipz to enjoy. This is a simple one sided flip book. Normally, I like to make two sided ones only, but that's a little more complex, so let's start with this one. It was designed for those pre-cut business card sheets. I advise printing it on card stock or brochure paper (I used Glossy HP Brochure Paper). But, doing so means cutting out the pages by hand. Reverse the last page, Pg. 40, to became the back cover. Use two staples from a heavy duty stapler(a plain office stapler may not be strong enough) to keep the pages from twisting. And here's some advance tips: Laminate the front and back cover pages (image side only) with those stick-on lamination sheets for protecting I.D. cards and such. That keeps the covers from being ruined by the oils in the fingers. Plus it gives the book a more polished look. Those who "get it", please show it the guys who don't, who leave post messages like, "...pointless" and "..why not just watch the video?" I'll try to make a movie of the version of the flip book, but I'm in the process of moving , so time is short. You can leave a comment here or when I post the movie. Finally, I got to post my Dragonfly Game Flipz™ book, featuring one of the latest trailer for Killzone 2 (E3 - 2007)for the PS3. This is follow up to my first Killzone 2 Flipz book for E3 2005 trailer. posted 9 months ago. For now, remember this is a Concept Demo and not for sale! Somehow the the youtube compression of the video really kills all the detail in the movie. I have to figure out how upload better looking videos, because it bugs me to no end to see my books looking so crappy, and muddy, that you can't see the image details. Sorry, everyone I'll try to do better in the future. As always you comments and feedback are welcomed. Congratulations to Craig T. for his winning bid on the Superman Toon Flipz book EBay auction. I'm sure Craig will enjoy it. I invite Craig to post here and share his impressions of the book with everyone.